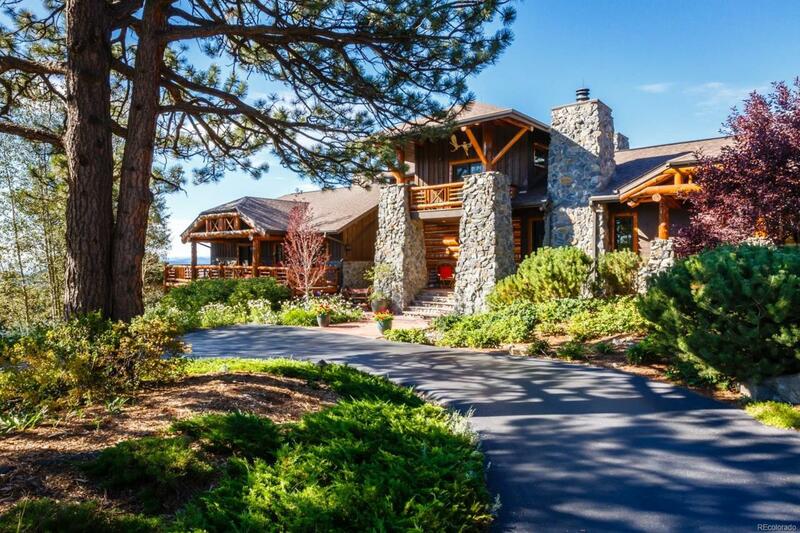 Magnificent 19-acre Adirondack-style mountain home in exclusive gated "Window Rock" enclave of Golden Gate Canyon. Home is less than 10 paved miles from downtown Golden and w/i a 30 minute commute to Denver and Boulder. Peeled log, stone and cedar construction with 100 year old fir floors from Denver Ice House. 5 fireplaces. Built in 1999 with renovations/add on features completed in 2003 and 2010; no expense spared. Impeccably landscaped and maintained w/ 360 degree views, gourmet kitchen, master retreat w/private office, numerous outdoor decks & patios, architected for a potential elevator, surround-sound media room & bar, home gym, loft sitting room, & custom woodwork throughout house. Oversized 2 car attached garage w/addit'l 1,500 finished square feet above detached 3-car garage connected to main house with breezeway. Less than a mile to 5,000+ acres of Open Space trails. Professionally landscaped to blend with mature native vegetation. Flexible A-2 zoning allows for horses.